3C Software offers interactive, instructor-led training sessions developed for ImpactECS users at all levels. Our courses are designed to teach attendees the tools, tips and techniques to build, run, and maintain models that meet your business needs. The ImpactECS Learning Path is designed to teach attendees how to leverage the building blocks in ImpactECS through hands-on activities and classroom exercises to emphasize the most important tools and features of ImpactECS. 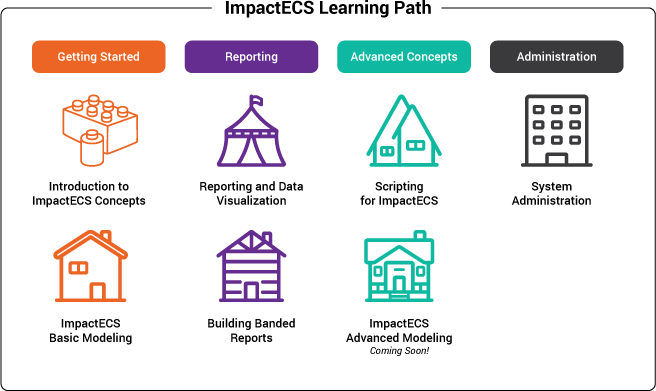 Starting with the individual building blocks, or item types, in the Concepts and Basic Modeling courses, our curriculum offers a comprehensive set of learning experiences for end users, model builders, and administrators to develop models that fit the needs of the business. The ImpactECS Concepts course highlights the building blocks of the application and covers best practices for model building. During the course, attendees will learn focus on the theory behind modeling, ImpactECS model components, and navigating ImpactECS. The Basic Modeling course is a hands-on session to create an ImpactECS model using the Item types explored in the Concepts course. Students establish business rules and identify data inputs to determine business outcomes. Topics covered include configuring ImpactECS Items, building Cost Objects and templates, and creating basic forms. This course focuses on methods and techniques to visualize data within the model and share results with non-ImpactECS users and other reporting systems. From standard printed reports to embedded dashboards, attendees are exposed to a variety of data outputs that are either accessible within ImpactECS or exported to other environments. For traditional reporting needs, like the ubiquitous cost sheet, banded reports allow model builders to create standardized reports that organize and group data from ImpactECS and other sources. Attendees of this course will have hands-on experience building a variety of banded reports for different use cases. Learn to automate data movement in and out of ImpactECS with the Scripting Basics course. Script types covered in the course include calculating, loading, analyzing, and exporting data between ImpactECS models and other systems. Competent system administration is key to the long-term success of ImpactECS. This course focuses on the basics of administering ImpactECS, including topics on system integration, security and user groups, configuring databases, and more. In addition to our standard courses, 3C Software works with client teams to develop model-specific user training to support their unique implementation requirements. Contact your professional services consultant, or email training@3csoftware.com for more information. For more information about training or to schedule a training class for your company, contact our training coordinator at 770-956-7744 or training@3csoftware.com.